Quiche! For dinner? Yes! I don’t know if that actually is kosher, but I love eggs, cheese, and artichokes… and I figured this would be a yummy quick meal. This turned out SO well, and was a delicious left-over as well. It came from a recipe on Health.com. The recipe originally called for egg substitute but instead I did a combination of eggs and egg whites until I had 1 cup of beaten eggs. Depending on the size of the eggs you use – you might want to adjust accordingly. Combine rice, 1/4 cup cheese, 1/4 cup eggs, dillweed, salt, and garlic; press into a 9-inch pieplate coated with cooking spray. Bake at 350 degrees for 7 minutes. 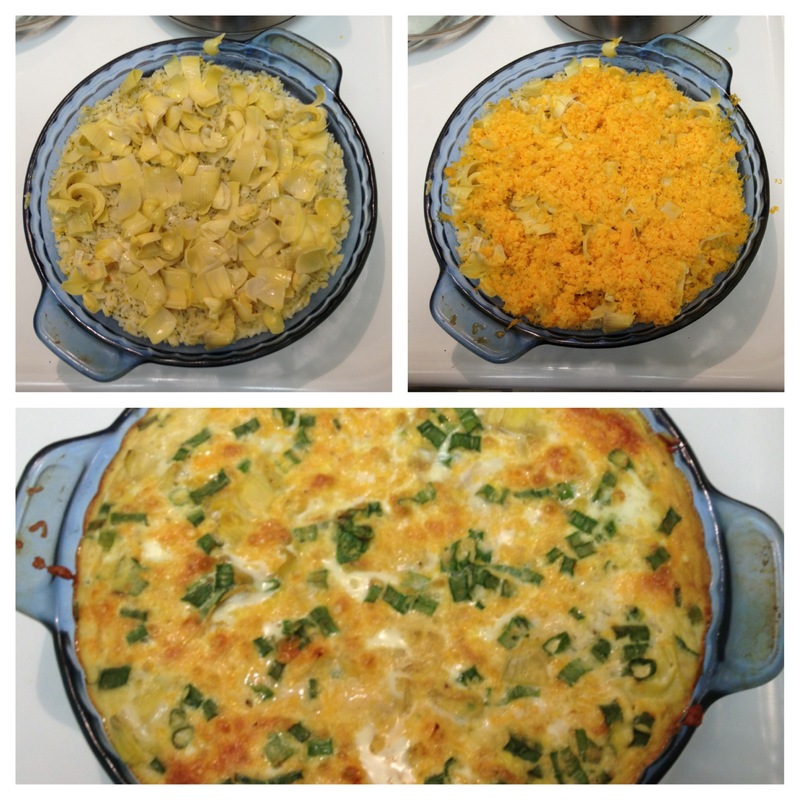 Arrange artichoke quarters on bottom of rice crust; sprinkle remaining cheese. Combine eggs, milk, green onions, mustard and pepper. Pour egg mixture over rice and artichokes. Bake at 350 degrees for 50 minutes or until eggs have set. Let stand 5 minutes; cut into wedges!